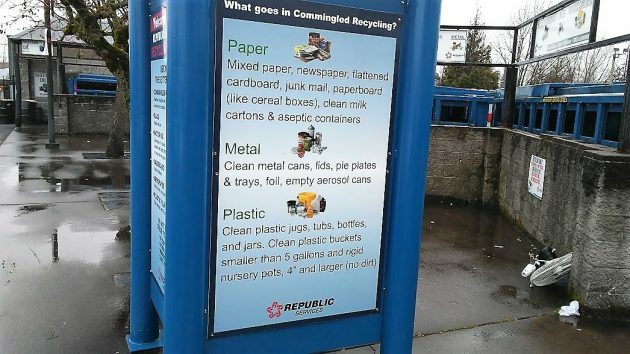 This sign at the Republic Services recycling depot on Industrial Way will have to be updated. Its advice is no longer good. Trash pickup by Republic Services in Albany and much of the mid-valley will cost $2 more per month because of the trouble with recycling. And we’ll be able to recycle fewer kinds of things. The Albany City Council voted 4-0 Monday to approve Republic’s request for the rate hike. (Councilors Rich Kellum and Ray Kopczynski were absent.) Since the company bills every two months, each bill will be $4 higher. As reported earlier, a lot of stuff people throw in their mixed-recycling or commingled carts is no longer recyclable because buyers no longer want it. And some of it was never recyclable in the first place, but processors or buyers — like China — put up with the trash because they wanted the rest. They no longer do. Republic’s Julie Jackson, municipal manager, and regional General Manager Shawn Edmonds appeared before the Albany council for the second time Monday. The company wants the additional income to make up for the collapse of the old recycling regime. Instead of selling stuff to a processor it now has to pay the processor to take it. The company has issued a very limited list of things that can still be put in the recycling carts: Steel and aluminum cans; cardboard and paper including newspapers and magazines and even phone books and paperback books; and plastic bottles and jugs. Republic has asked for the same rate hike in other jurisdictions in Linn and Benton counties. Lebanon’s council will take it up in May. Harrisburg has approved it. Others are scheduled to consider it or may have already approved it. With the rate hike Republic plans to keep commingled recycling going but try to get people to throw less trash into the recycling carts. One alternative would have been to put everything in the trash and take it to the Coffin Butte dump. But the council didn’t like that. One worry: What happens when Coffin Butte gets full and no other landfill can be licensed? Republic’s Edmonds told me that Coffin Butte is estimated to be able to accept refuse for another 35 years. The dump has been growing taller every year. Julie Jackson said the state says the landfill can’t get taller than the top of Coffin Butte, the hill for which it is named. But it could presumably expand sideways. I would like to see Republic use scanners to scan cans, so that customers only get charged for days that they put carts out. That would be awesome. So when the customer calls in a miss, if the cart wasn’t scanned then that means it wasn’t out. So many time the drivers have to go back for carts that weren’t out when the driver was there. Love that idea. I guess we can be thankful that the City Council didn’t approve this insult to Mother Nature (and those who have been carefully recycling for decades now) on becoming effective on Mother’s Day. I suppose we can expect in another couple of years that the list of “acceptable” items for recycling will be trimmed down to just items containing silver, gold or platinum. Another couple of years and they will clarify that only Sterling Silver and gold 14k or higher will be accepted. Thanks Mayor, et al. This should help attract new residents that prefer an area with a backwards view of protecting the environment – and reduced land values near the new refuse sites which will be needed to bury all those unrecycled materials. This is an angle I hadn’t previously considered. The mayor should definitely jump on the first available flight to China and tell them in no uncertain terms that they must accept and pay for whatever we choose to put in our recycle bins. If Wes Hare were still city manager, he would go with the mayor to China. Good article in Sunday’s Albany D-H about recycling. I didn’t realize that a pizza box is considered contaminated owing to the oily residue. Regarding can lids, if you don’t crush them inside the can DON’T put them separately in recycling as they slip off the processing conveyor belts & jam the works up. O.K., turn about ought to be fair play China! Stop packaging all the products in plastic that can’t be recycled! And please “outlaw” those Styrofoam peanuts & packing that many large products come in. Hey, remember when somebody thought it would be a good idea to add a composting option only to have half the town spew furious vitriol over that hippie dippie B.S.? Who’s kicking themselves now? That would have helped alleviate some of the now additional trash that’s getting shipped off to the Butte. Sadly we’re all now paying the price of a failing system that other people decided to abuse by treating those carts as second trash cans. Trash is an interresting subject since it is a person’s trash that indicates level of success in life. As an American I am a failure. So obvious to others, I was blind for so long. You can measure a person’s Americanism by their consumerism. It occurred to me recently that I do not support the great trash society. I am ashamed to admit that I produce less than one can full of garbage in a year. Like a wart upon the tip of my nose seen by all, so large that it blocks my view of patriotism, since a good American goes deep in debt to aquire products to support commerce. Your trash is the indicator of your abilty to consume. My failure of love for foam packing and plastic wrapping has warped my concept of the value of material things, things of which give great pleasure, all be it temporary in delight and eventually useless. The real value of life lies on the shelves of department stores. It must be a mental defect, I can’t remember when it began. When I walk through Wal-Mart, for example, I see nicely packaged and organized trash. I cannot bear to remove it from is beautiful place knowing that if I buy it, I will destroy it. I do recycle and the new rules will not affect me. I also convert non toxic organic material into heat energy. Imagine what the world would be like without trash. I agree. I no longer want to buy anything more than I can use. I don’t want to contribute to the trash society…that is, capitalistic consumerism. Capitalist Consumerism, indeed. The very idea that your average slob-Bob American should actually have to think about the mountain of trash we each spew out is anathema to citizenship in the Good Old USA. However, this should be seen as an opportunity for the current batch of middle-aged, under-educated White males who can’t seem to get a gig. Imagine a new career as a Recycle Sorter, standing for 8 hours each day, sorting out America’s detritus. Talk about sweet revenge against White Male Privilege. Recycling had some justification when the result was profitable. Now that it is no longer so, only the bambinomics of the environmentalist sect can explain why it is still a good idea. I really appreciated the comment from James Engel. He hit the nail on the head. Not only is the packaging harmful, but if you try to open it you might need a trip to the emergency room because the sharp edges can cause injury. It’s like they never really want you to open your purchase. Good thought, but some things shrink the benefit. The trash/garbage stream tends to have enough moisture to require an auxiliary fuel to keep a flame. The ash stream, though smaller than the trash stream, still needs a storage location and plan. To paraphrase the 2nd law of thermo, you don’t get something for nothing. Frankly there are several “trash to cash” scenarios that could be viable. I think you are on to something Tom, perhaps we can use the heat generated by the incinerator to treat the sludge from the failed water treatment plant. It would be nice to come up with a plan to reduce the cost burdens on the citizen rather than an increase, maybe do a little out of the box thinking. Instead of filling up the landfills with the waste, we can mix the ash and treated sludge and create a usable fertiliser. The paperwork filed by Republic said they conducted meetings with City and County officials on 3/18 to explain the current problem. Linn County Commissioners say no one from Linn County has been contacted by Republic for such a meeting. I’m hoping the Two Counties will collaborate on a path forward and just not go along with fee increases over time.